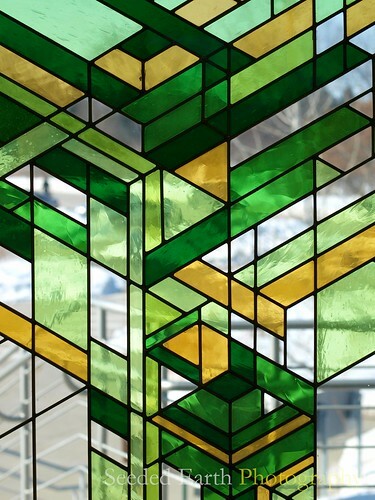 The doors of the University of Wisconsin – Madison Arboretum are panels of stained glass deeply tinted in greens and golds. And I love that you can see just the hint of the natural world through this colorful portal. As for the choice of colors . . . green and gold remind anyone of a certain National Football League team? Interesting combinations. That would make a great door for an Arboretum! Someone put it all together. Love the abstract nature and colors in this. The light – as it filters thru -is beautiful! Packer country, Gandalf! Bears? Not even close! this is one amazing door! I love colored glass of any kind…but this is outstanding.